Second meme, and my second favorite couple: Marian and Fenris! 4.Heh, inspired by , I imagine Fenris rages about Danarius and slaves. Marian, one drink, and she's out like a light. 6. 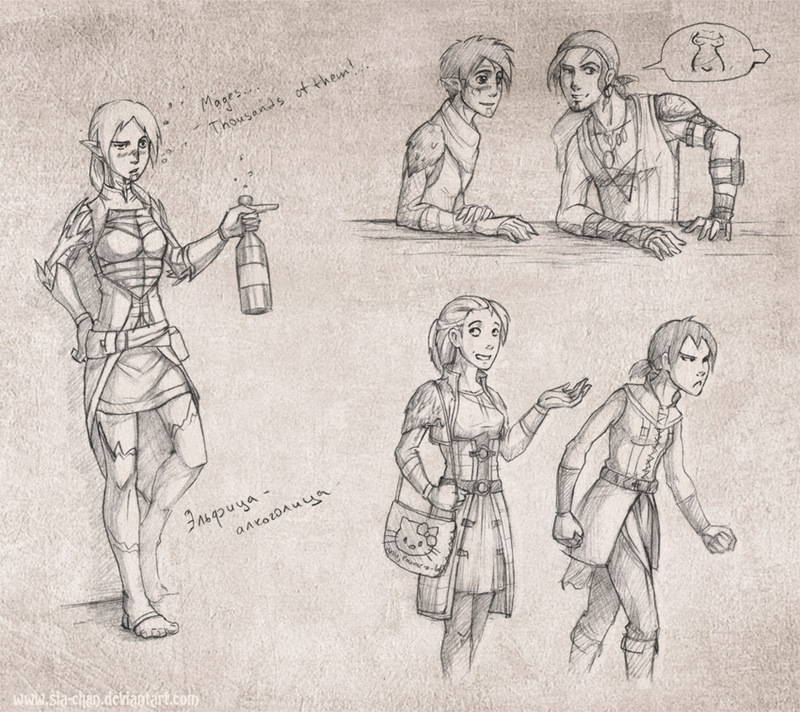 I don't think Fenris knew quite what to do with this irreverent mage who made bad jokes all the time. And his reactions just egged Marian on. XDn Oh, the skull on a stick is the staff you get from the Black Emporium, which Marian used all through Act 1. 7. I couldn't resist drawing a bow on Fenris. I couldn't! 11. Yes, she dances when she wins. In her smallclothes. Which is why Fenris lets her win, eventually. Gerald and Merrill should be done, hopefully, by next week. XD Marian applauds your sense of humor. Your most terrifying vision of evil revisited! Murray is so awesome. snarkHawke is awesome. Glad you enjoyed! Best gender swap I've seen out of all the couple memes I've looked at thus far. if there would be Fengirl, 95% of romances are with her. Hahaha, that would be true. Oooo, thank you for the examples! try your own Fenrisa, pls or Femrisa? If I feel inspired. I'm currently working on other things so it'll be a while if I do. a little gender bender never cant harm. 'Murray'. I see what you did there. PFFT! I lol'd like crazy at 'Murray'. Personally, I called my skull-on-a-stick 'Louise'. Actually, it's a poor inside joke between my friends and I about the Grateful Dead skull you see in all of their iconic imagery. Silly, actually. I LOVE how you draw Fenris!!!!!!!!!!!!!!!!!!!!!!!!! Thank you! He is fun to draw. I wouldn't mind seeing 10 either Fenris! I love the "Murray" part! Why, yes, I believe you do. 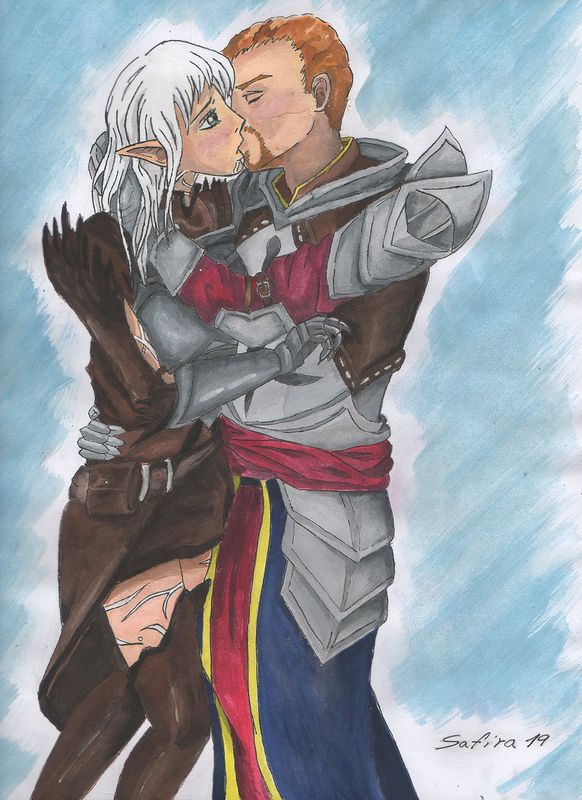 Fenris is so irresistible!!! And I love the drinking panel here. Thank you! That amused me as well. This is the funniest meme I've ever seen, I love everybody's versions of it! If I tag you will you find the time? I'm running out of couples. I love this meme too! Makes me think long and hard about all the characters I've been putting into it. Definitely, it will make them climb some positions in my priority list! So go ahead, it's a great excuse! I literally burst out laughing and had to 'splain myself to my mother at that. Glad to know I succeeded in some giggles! Drunk Fenris raging about Danarius is hilarious. I guess that's a normal night for him, though. Yep, I figured Fenris and his Danarius issues come out even more when drunk. "I call him Murray" I see what you did there. For some reason the third and fourth panels just crack me up, ah Fen and your rage issues.